In celebration of KitchenAid’s 25th Anniversary, QVC is giving away $5,000 worth of appliances during the Kitchen Aid Sweepstakes. New prizes every week, for four weeks. The Sweepstakes is open to legal residents of the CONTIGUOUS United States and District of Columbia, excluding Rhode Island, who are 18 years of age or older as of the date of entry. The Sweepstakes begins on August 30, 2017 at 12:01AM (ET) and ends at 11:59PM (ET) on September 27, 2017. 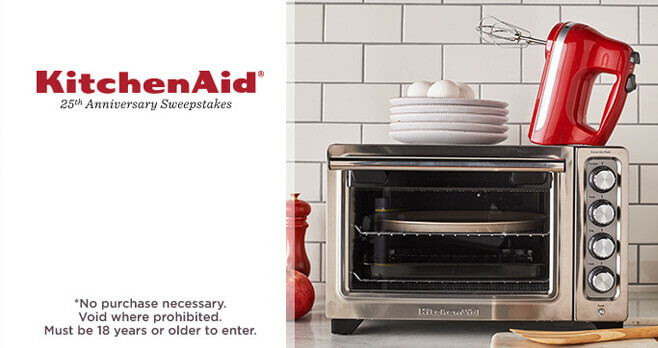 To enter online, you must complete the sweepstakes entry form, including your e-mail address, at the website http://www.qvc.com/KitchenAidSweepstakes.content.html. Limit of one entry per person per day during the entry period. A random drawing will be conducted by the Sponsor on the dates listed below from all eligible entries received during each relevant Sweepstakes drawing period. Listed below are the prizes that will be awarded in this Sweepstakes. For the names of the prize winners, mail a self-addressed, stamped envelope to: KitchenAid 25th Anniversary Sweepstakes, QVC Studio Park Mail Code 150, West Chester, PA 19380, no later than October 27, 2017. KitchenAid products are always quality and last for years. When you invest in this name you already know you can count on a quality item. These products perform exactly as they are advertised! I have many KitchenAid products and love giving my family KitchenAid! I love kitchen aide products. Also, Great fun watching David in the kitchen.